The forum is english, but there are persons from all over the world there. It doesn’t matter, where you are from, as long as you are able to speak at least english at a basic level, you are welcome there. The topics in the forum are about “Beermoney”. The meaning of Beermoney is: small things to do, to earn enough money to buy some glasses of beer each week. Of course, you won’t become rich there, but you can easily earn some Euros each month. There are also a lot of different topics about sites to make money online there. There are a lot of different categories there, but I am going to tell you about them later. How can you earn Money at BeerMoneyForum? BeerMoneyForum offers you their own currency, called BMF. 1000 BMF are worth 1 Dollar. If you open a new topic you earn 50 BMF, if you post in another thread you earn 20 BMF. That’s a lot, but you have to make high quality posts. If you spam, you will lose your BMF and you can also get banned. That’s how the forum looks. As you can see, there are a lot of different sections there. But all of them have something in common. How can you make money online. Every time a member of the community finds a new site, he posts it there to discuss it and talk about it. Members also share their payment proof and then a site gets either tagged as legit or as scam, depending on the opinions of the users. That means, you can easily see at the first glance, if a site is currently legit or not. Maybe you wonder why I said currently. Well, I did, because noone is able to tell you if a site stays legit or not. It happened already, that a site pays for some years and then the turn to scam and everybody loses their money. Sadly, there is a category about HYIP. I really dislike that topic, because in my opinion, that is just helping others to scam people. I recently did a post about HYIP (look at it here) and I explained there, why I dislike them. But a lot of people love them. I really don’t understand why. If they just don’t know that HYIP are scam or if they don’t care, I can’t tell. But listen to my warning. Stay away from them. Every HYIP is a scam. Yes, EVERY. SINGLE. ONE. But aside from that, the forum is really good and you can find a lot of information about making money online there. That means, you can not only earn BMF there, you can also search for different sites to make money online and test whatever you like. You can even post your referral links there, but just if you open a new topic or if you post a proof of payment in an already existing one. There is also a marketplace there. Members of the community post different offers there and pay BMF, if someone completes them. Maybe you have to like a retweet a twitter post, share something on facebook, like a video at youtube or register as a referral for a site, you can get paid there for all different kind of things. Of course, you can open your own topic at the marketplace and pay people with your BMF. I use the marketplace to pay people to become my referrals at different sites. That means, they also earn something, if they register as my referral for a site. It’s a win-win situation. The support from the admin is also very good and fast. If you have any questions or problems, he helps you fast. Also, if you report spam, it gets removed very fast by him and the spamer will get punished. The downside of a forum as big as this one is, there are a lot of posts with low quality. Personally I think, a lot of people just post to earn their BMF and get paid. The quality of their posts is lacking and often they don’t contribute anything useful to a discussion. But still, the most posts are helpful, even if there are some exceptions. Of course, there is also a referral programm at the forum. But it’s really simple. If you refer someone and he makes 100 high quality posts, you earn 1000 BMF. That means, you get 1 Dollar. Simple, but good. 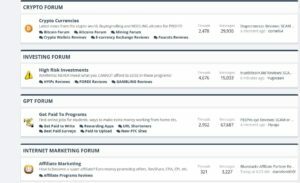 Does BeerMoneyForum really pay me? Yeah, you really get paid there. I already got a payment, but I just cashed out to show you a proof of payment. I am using my BMF for my offers at the marketplace. But to test it and to show you, that BeerMoneyForum really is legit, I cashed out 1 Dollar. Here you can see my proof of payment. Don’t wonder, the name is the name the admin uses for his PayPal Account. The payment really is from BeerMoneyForum. It’s not a whole Dollar, because PayPal takes their share of it, and they are really high for such a low sum. But as you can see, you get your money from BeerMoneyForum. You get your money where you want to get it. You can choose between the following. Yeah, that’s correct. You can also cash out in cryptos, if you want that.